Prodigy Comfort Elite, the latest adjustable bed from industry famous Leggett and Platt is a direct competition to Reverie 9T. Prodigy 2.0 had been the market leader for a long time and ahead of Reverie 8Q. But Reverie with the launch of its advanced 9T model had conveniently left behind Prodigy 2.0 in competition. And now Leggett and Platt has come with this latest and most advanced adjustable bed, Prodigy Comfort Elite. Head and feet adjustments are part of every adjustable bed on the market. But pillow and lumbar adjustments are advanced and need sophisticated design. Prodigy Comfort Elite offers both pillow tilting as well as lumbar adjustment. Offering perfect pillow tilting can rather be said as a trademark feature of all Leggett and Platt adjustable beds. It has dedicated buttons on remote control for pillow tilting. Reverie 9T offers only lumbar adjustment and no pillow tilting. Both Prodigy Comfort Elite and Reverei 9T offer wall hugging feature. 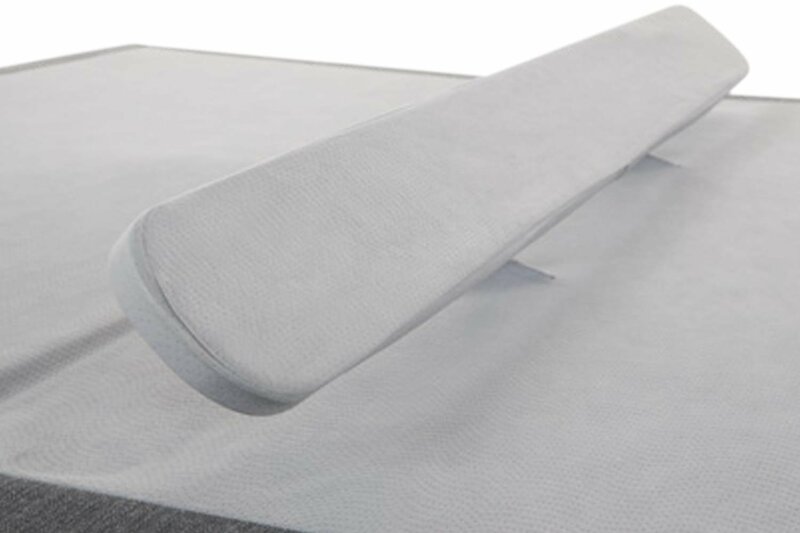 As an alternate to traditional mattress retention bars, advanced adjustable beds are now coming with new and innovative mattress strips. This new feature includes two strips, one at the top and the other at the feet section, that are designed to hold the mattress in its place and prevent it from slipping sideways or downwards while performing adjustments. While it is called as MicroHook retention system in Prodigy Comfort Elite, in Reverie 9T it is named as ProGrip Technology. Quick note, both Prodigy as well as Reverie 9T packages also include traditional mattress retainer bars as backup. Leggett and Platt offers touch capacitive remote control with Prodigy Comfort Elite. It is similar to the remote control that comes with Prodigy 2.0. It also includes a remote holder. Leggett and Platt's touch capacitive remotes were the most advanced on the market until Reverie came up with OLED powered remotes. While Prodigy Comfort Elite comes with 2 preset positions, Reverie 9T comes with 3. Prodigy Comfort Elite comes with as many as 6 memory programmable positions compared to only 2 in Reverie 9T. Whereas, Reverie 9T comes with the standard LED powered under the bed lighting system. This is one major feature that puts Prodigy Comfort Elite way ahead of Reverie 9T. It's clearly a deal maker for Prodigy adjustabe beds. Prodigy Comfort Elite comes with a total of 4 USB ports for each base. Hence, a split-king/queen version comes with 8 USB ports, 4 on each side. Whereas, Reverie 9T has only 1 USB port that too on its wireless Qi charging pad. Prodigy Comfort Elite comes with 4 inches and 6 inches individual leg units which when combined stand at a maximum height of 10 inches. And very similar to Prodigy 2.0, Prodigy Comfort Elite too offers height adjustability at every inch between 4 inches and 6 inches. There are cavities for every inch into which pin can be inserted to attain desired height (as shown in the image here). Reverie 9T comes with 3 inches and 5.25 inches leg units that combined offer 8.25 inches of maximum height. There isn't per inch height flexibility like in Prodigy Comfort Elite or Prodigy 2.0. Both Prodigy Comfort Elite and Reverie 9T's individual units support weights up to 850 lbs. That means split king/queen versions support weights up to 1700 lbs. When it comes to massage functionality, there is absolutely no match to Leggett and Platt's adjustable beds. In fact, their motors are the most advanced and industry famous for offering whisper quiet performance as well as ultimate massage experience. Reverie on the other side has significantly worked on improvising its massage functionality. This is evident from its new and powerful massage motors installed in its Reverie 9T model. Prodigy Comfort Elite has mobile app for both Apple iOS devices as well Android devices. Whereas, Reverie 9T too has a mobile app but only for Apple iOS devices. With the launch of Prodigy Comfort Elite and the features that are embedded in it, Leggett and Platt has brought in the competitor to Reverie 9T. 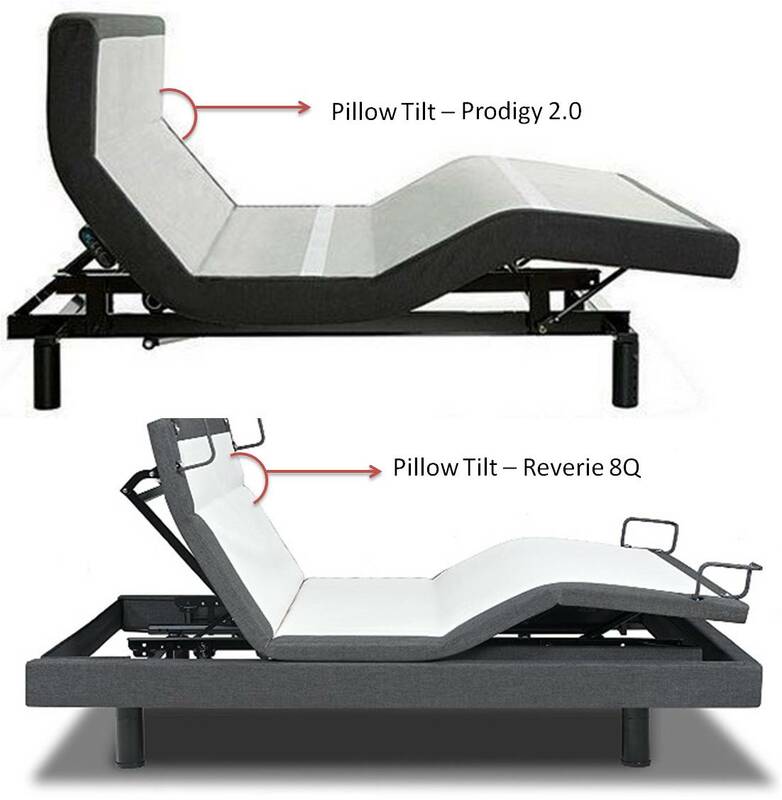 Until the launch of Prodigy Comfort Elite and Reverie 9T, Leggett & Platt Prodigy 2.0 was undoubtedly the best premium adjustable bed in the market. 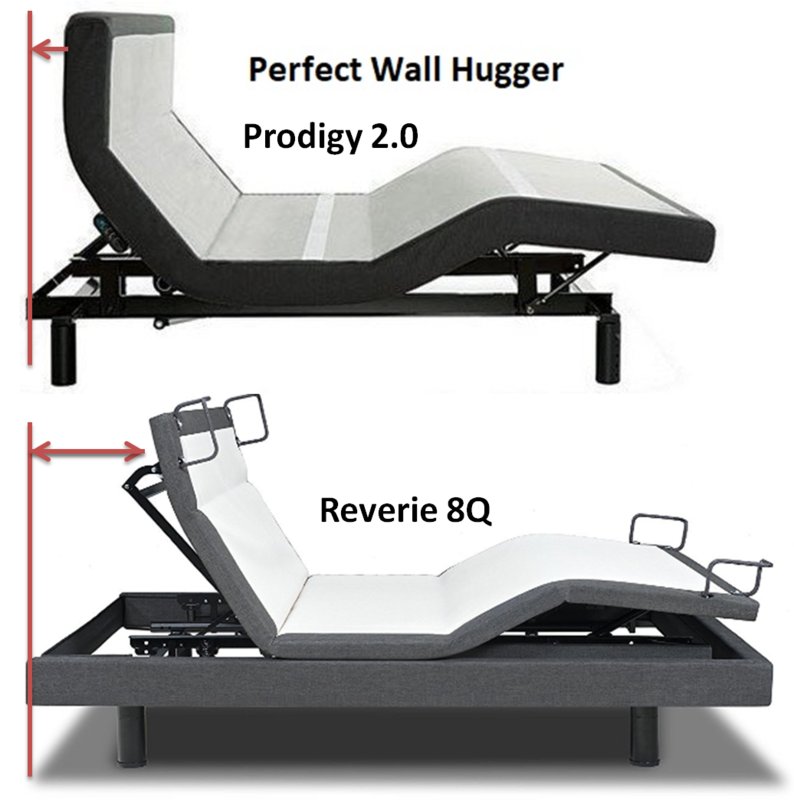 Although Reverie 8Q is another advanced adjustable bed on par with Prodigy 2.0 but owing to couple of missing features it stands right behind Prodigy 2.0. Every feature embedded in Prodigy 2.0 has been crafted to perfection. Except few, most of these features are available in other adjustable beds as well. But there is a significant difference in their performance level. And again, if someone is under the impression that Prodigy 2.0 costs more than other adjustable beds then they have to realize that the performance of Prodigy 2.0 is light years ahead of others. Let’s have a look at each of these features in detail and also compare the same with other adjustable beds in the market. Wall hugging is an ultimate comfort feature. I would say it’s a must have feature if you experience difficulty while turning backwards or sideways while sitting in your bed, especially for elderly people or for those recovering from health ailments. Few other adjustable beds also offer wall hugging feature but there is a catch in their performance. What’s wall hugging? When you lift the head section upwards to your desired angle, the upper section of the bed simultaneously moves away from the wall. This is when you have to stretch sideways/backwards to reach your bedside table. But with wall hugger feature, the bed’s head section stays in its very place without moving away from the wall, thus removing the need to turn backwards. Without Wall Hugger: Simply imagine you are working on your laptop with your head section lifted upwards, away from the wall and you need to reach out to your mobile or water placed on the bedside table. You try to turn but all the while you have to be careful that your laptop doesn’t slip and fall. For elderly people or health patients, turning sideways or stretching backwards is a painful process. With Wall Hugger: But if your bed really didn’t move an inch from the wall even when the head section is lifted upwards, there absolutely no need to fear that your laptop might fall, no need to turn or stretch backwards to reach the bedside table. Prodigy 2.0 offers this wall hugging feature to perfection. The below comparison illustrates why I mentioned that every feature in Prodigy 2.0 is crafted to perfection. Wall Hugger® engineering embedded in Prodigy 2.0 is a bench mark which no other adjustable bed has been able to breach till date. 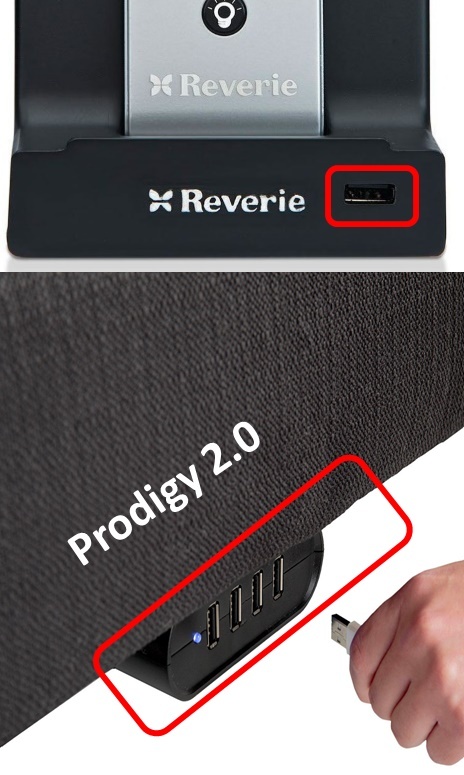 Even though Reverie 8Q also offers wall hugging feature but it is not as perfect as Prodigy 2.0. The distance between the wall and the head section will still be around half-feet to one-feet depending upon the inclination. As S-Cape is again from Leggett & Platt, unique wall hugger™ engineering has been incorporated in this model as well. It works the same way as in Prodigy 2.0, headboard sticks to the wall no matter how much you tilt the head section. The primary task of an adjustable bed is to offer head & foot tilts and every adjustable bed offers these basic adjustments. Whereas, only a couple of beds like Prodigy 2.0 and Reverie 8Q offer pillow tilt in addition to basic head and foot tilts. Pillow tilt is a must have feature if you are used to working on laptop or writing/reading while lying down in your bed. While doing these tasks, if you have ever noticed, our head tends to incline forward and we typically place a pillow to support our neck and back. Yet, it is still an unbalanced posture which might result in neck pain in the long run. Pillow tilt removes the need to have an additional unbalanced pillow and provides the right inclination, supports our neck and helps us focus better on our work. Pillow tilt is an advanced feature and needs exquisite design. Even though other adjustable beds offer most of the advanced features but pillow tilt is something beyond their design expertise. Reverie 8Q also supports wide range of head and foot tilts. However, pillow tilting is linked to the head section adjustment. As you raise the head section, simultaneously the pillow section also adjusts accordingly. Of course, it is not as perfect as Prodigy 2.0. 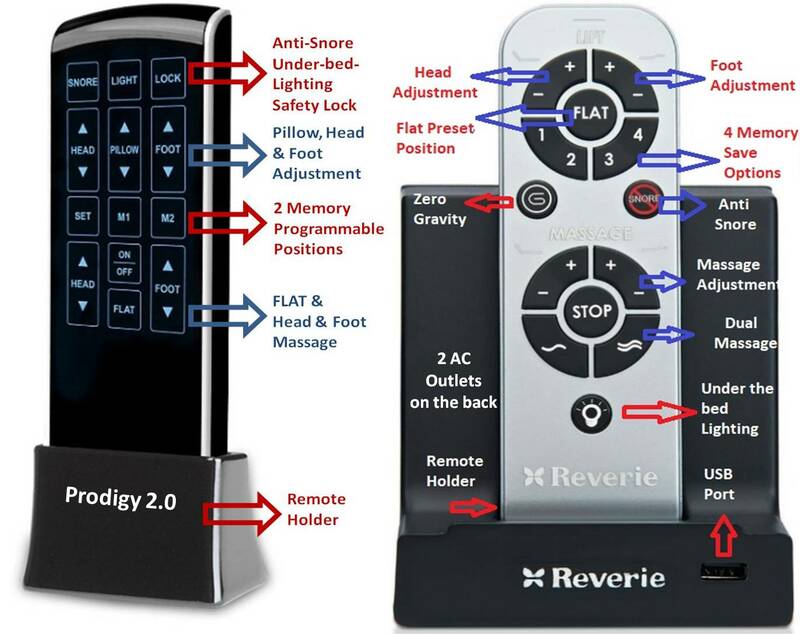 Just like head and foot section adjustments, Prodigy 2.0 has dedicated options on remote to adjust the pillow section to desired angle but Reverie 8Q doesn’t have such an option. S-Cape only has head and foot tilting. Pillow tilting has not been included in the design. Typically, adjustable beds have only one retention bar at the foot level just to avoid the mattress from sliding downwards. 1. 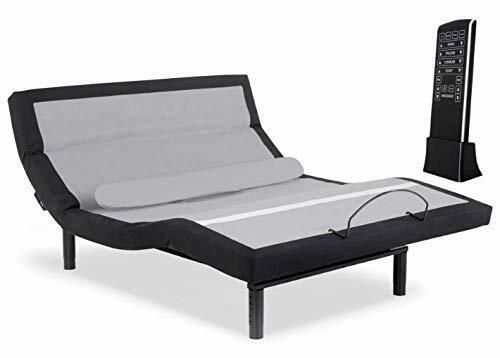 Yes, these retention bars do hold the mattress in its place but we could still notice that the mattress does sway slightly as we perform adjustments or when the massage motors are working. 2. And while putting on covers, there is always this difficulty in tucking the covers beneath the retention bar. Every time you do it, you have to either push your hands into the retention bar to insert the covers correctly or lift the mattress, tuck the covers and then push the mattress into the retention bar. Even though it’s not difficult, but sometimes it’s annoying. 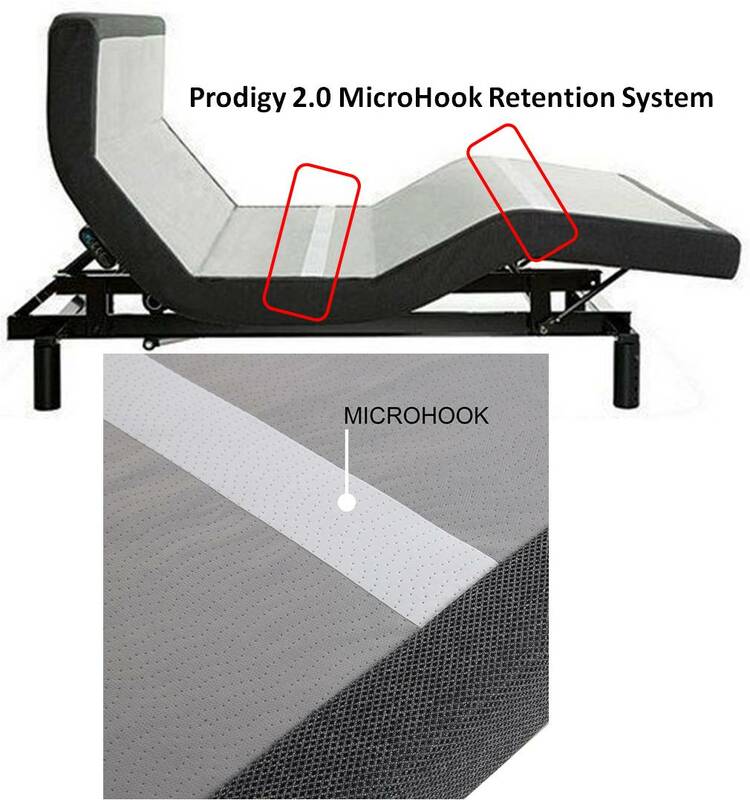 Prodigy 2.0’s MicroHook™ retention system removes the need to have metal bars. These are strips that run at the middle and lower sections of the bed. Their grip is so perfect that it latches to the surface of the mattress and absolutely holds the mattress in its place. However, it is specifically designed for one sided mattresses. Do the adjustments, turn-on the vibration motors, jump around but the mattress will stay in its place. And this is called PERFECTION. Prodigy 2.0 does not offer any feature just for the sake of offering it. It puts in time, effort and walks the extra mile to offer every feature to utmost perfection. Unlike other beds, Prodigy 2.0 might cost a bit extra but it’s PERFECT. 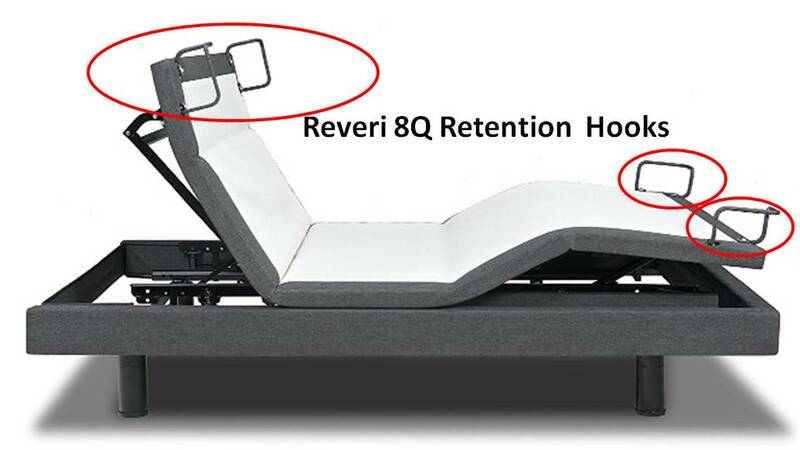 Reverie 8Q has mattress retention hooks on all four sides. But there is a catch here. These retention hooks are non-removable and might make bedding a bit time consuming. Nonetheless, having retainer hooks on all corners holds the mattress perfectly in its place, just like Prodigy 2.0. It depends on the model that you are choosing. Certain models come with traditional retainer bars while others with removable micro-hook retention system, just like in Prodigy 2.0. USB ports are a must have feature. At any given time, we have at least couple of devices like mobiles, power banks or tablets that need to be charged frequently. However, charging points are mostly away from our bed and all that we could do is place them on the bedside table until they are charged to requisite levels. But having charging ports embedded to your bed and right on the sides of the frame is highly beneficial. And Leggett & Platt Prodigy 2.0 does offer USB ports and there are altogether 4 ports on each side. So, if you have a split king version then you would have totally 8 USB ports. 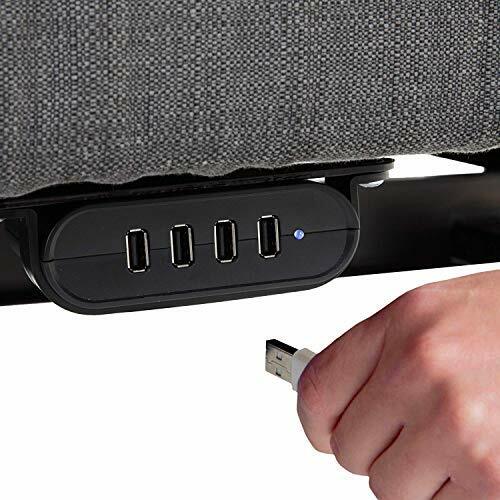 And yet again, no other adjustable bed comes with 4 USB ports. That’s Prodigy 2.0, when it offers something it’s the finest and to the fullest. Reverie 8Q comes with a single USB port embedded at the front of remote holder. However, the biggest advantage is that it also has 2 AC outlets at the back of the remote. Not just your mobile but you can even connect your laptop charger as well. Prodigy 2.0 doesn’t come with AC power outlets. The only flaw with S-Cape model is that it does not come with even a single USB port. All high-end adjustable beds offer wireless, backlit remote controls. That’s like an advanced feature. But offering wireless, backlit and touch capacitive remote control is, perhaps, a super advanced feature. Well, no other adjustable bed in the market offers touch capacitive user interface for a remote control. Prodigy 2.0 is the only bed that has done it till date. Additionally, it also comes with a remote control holder. That adds security. Reverie 8Q remote control is neither backlit nor touch capacitive. However, Reverie 8Q also offers remote control holder along with a USB port embedded to it. This is one rare area where Reverie 8Q has scored over Prodigy 2.0. Backlit remote controls are available with certain S-Cape 2.0 model. Although, there is no remote control holder but the base is quite flat that they can stand vertical. 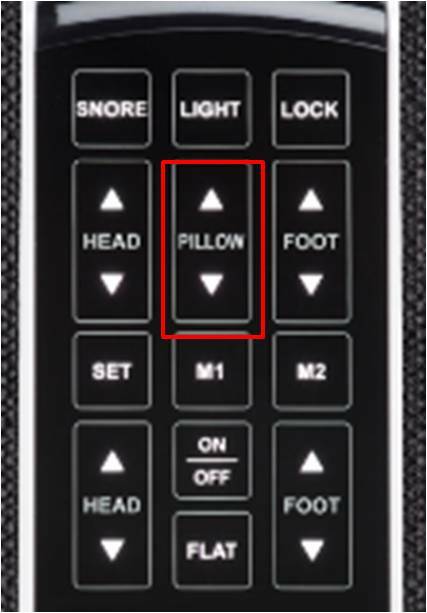 Flat and anti-snore are the only preset positions offered by Prodigy 2.0. Zero Gravity, TV/PC and lounge are the additional preset positions that most advanced adjustable beds have to offer. Anti-Snore: However, anti-snore is an advanced feature that not all adjustable beds offer. This is an important function as most people, at some time or the other, suffer from snoring issue. In anti-snore position, the head section lifts by around 30 degrees, opens air valves, improves breathability and reduces snoring. In addition to Flat and Anti-Snore, Reverie 8Q also offers Zero-Gravity as preset position. Most adjustable beds have zero-gravity preset position but really it’s somehow missing in Prodigy 2.0. Nonetheless, as Prodigy 2.0 has 6 memory programmable options, you can always configure and save zero-gravity as a programmable position. In S-Cape 2.0, Leggett & Platt has included zero-gravity as preset position along with Flat and Anti-Snore. Memory savable positions are a delight to have. A preset TV/PC or lounge position might not be at the same desired angle that one would prefer. This is when memory savable positions come in handy. You can tune into your favourite angle, save it and happily tune into the same at any time in the future. Prodigy 2.0 offers six memory programmable/savable positions, M1 & M2 from remote and 4 more from mobile app (Android & Apple iOS). While most other adjustable beds offer no more than 2 memory savable positions, offering 6 positions is a huge lead for Prodigy 2.0 over its contemporaries. Reverie 8Q offers 4 memory savable positions and all 4 are configurable from remote and none from its mobile app. S-Cape comes with 2 memory programmable positions on remote, M1 & M2. However, as it does not have a mobile app, there are no more additional memory savable positions. Another major reason that prompts most people these days to buy an adjustable bed is its massage function. And who doesn’t want to enjoy a perfect massage after a hard day at work? A massage that runs therapeutic waves from head to toe at our desired intensity levels. Almost all high-end and mid-range adjustable beds do offer massage function. 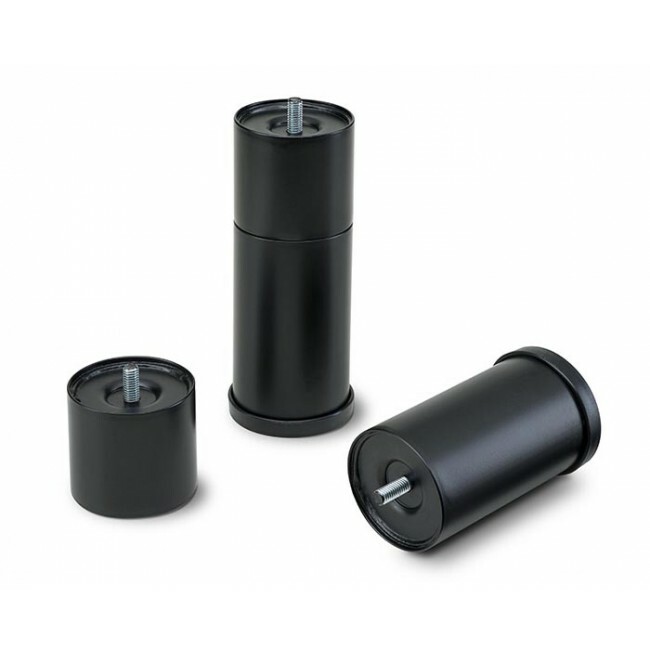 However, noise emanating from these vibration motors is something that no one should ever ignore. But motors installed in Prodigy 2.0 are both powerful yet ultra-quiet. 1. It offers dual massage function for both upper and lower body. 2. Additionally, the wave massage runs therapeutic waves from head to toe offering full body massage, relax your muscles and help you quickly fall asleep. There are three massage intensity levels to choose from – low, high and medium. 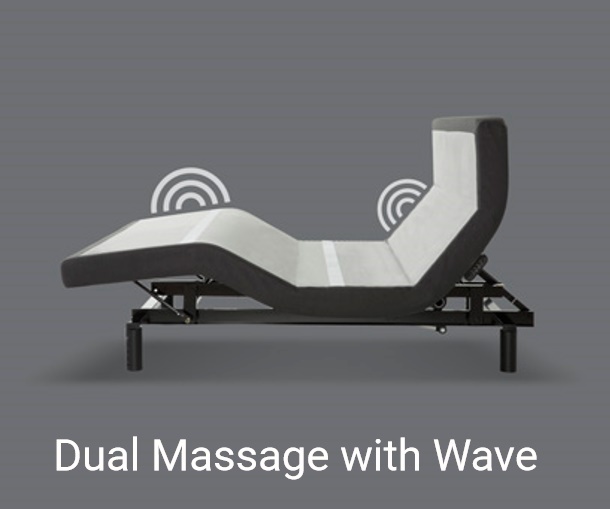 It offers only dual massage feature for upper and lower body. You can choose between 1 and 10 intensity levels. Massage functionality in S-Cape model is similar to Prodigy 2.0. It has both wave massage and standard massage. In wave massage, therapeutic waves run from head to toe while in standard, therapeutic waves are focused around upper and lower body. Most beds come with height adjustability but when I say this I am talking about two individual units that have to be combined to get maximum height. For example, there are beds that have 6 inches and 3 inches units. So, when you are not okay with 6 inches height, all that you can do is add the 3 inches unit to the 6 inches unit and combined you would get 9 inches height. But what if you just want 7 inches or 8 inches height instead of mere 6 inches or max 9 inches height? And this is the flexibility that Prodigy 2.0 offers. It has 6 inches and 4 inches units but placed within each other and not as individual units. There are cavities for inserting pin at every inch. So, if you just need 8 inches height, lift the leg and insert the pin in the right cavity to attain desired height. It offers two individual units, 3 inches and 5 inches and when combined offer total 8 inches height. Height adjustability in S-Cape is very similar to Prodigy 2.0. It has two lengths within each other and allows adjustability between 6 to 10 inches. 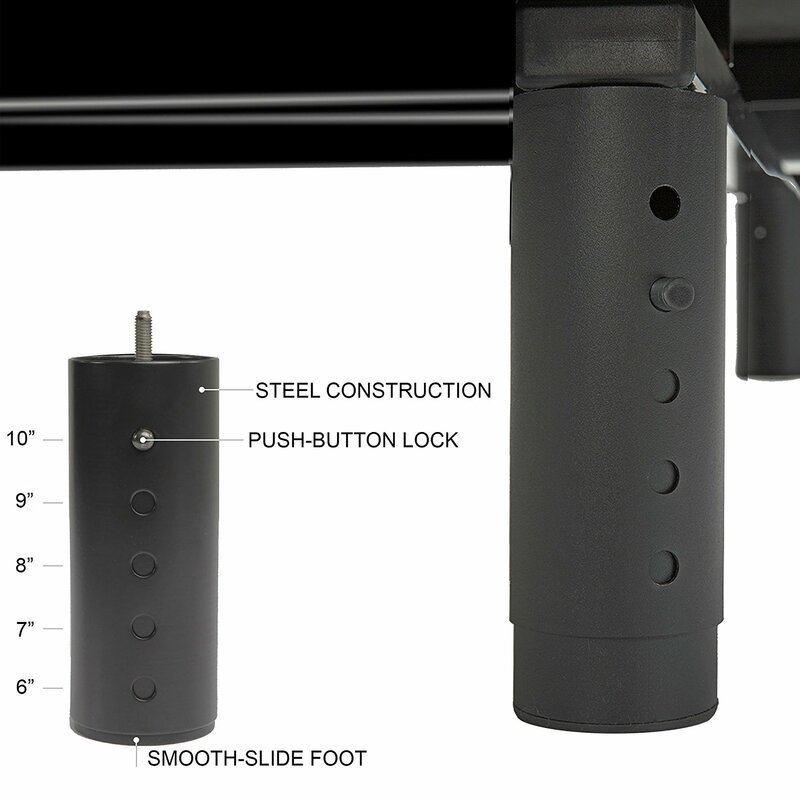 With pin model, you can adjust it to every inch between 6 and 10 inches height. 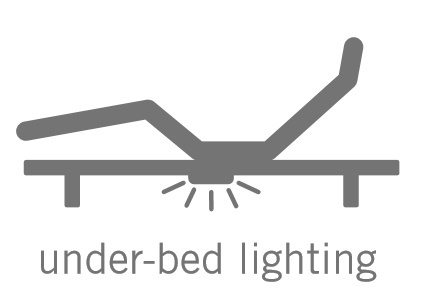 Under the bed lighting system looked like an innovative feature initially but over a period almost all leading high-end and mid-range adjustable beds have this feature embedded. Minimum non-intrusive under the bed lighting system helps you safely navigate to your bed in pitch dark rooms. Prodigy 2.0 offers this feature and it can be controlled from its remote and mobile app. Reverie 8Q also offers under the bed lighting system that can be turned on/off directly from its remote control. S-Cape 2.0 also offers this feature. Alongside remote control, Prodigy 2.0 also provides the luxury of controlling the bed from your mobile as well. It offers both Android and iOS apps. Mobile app functionality is not just replica of remote control but the app also offers several additional functionalities as well. Out of the total 6 memory programmable positions, while remote control offers only 2, mobile app offers additional 4 positions. Reverie 8Q also offers mobile app for both Android and iOS devices. S-Cape doesn’t offer any mobile app. Some of us have the habit of falling asleep while watching TV or reading a book. Instead of being in a flat position, the bed might be in a TV/PC or lounge position when we slip into sleep. And no matter in whichever position the bed might be in when you fall asleep, with sleep timer ON, the bed will return to flat position upon reaching the set time. The alarm functionality is of two types in Prodigy 2.0. 1. The remote will beep on reaching set time, but we all have mobile phones that also do the same task. 2. Wake up by gentle massage: The bed comes with a built-in alarm feature and this is surely a luxury and not to be found even most other advanced adjustable beds. It is like wake-up by massage wherein the bed vibrates gently upon reaching the set time. A gentle massage early morning is surely a bliss. Although it does not have beeping alarm on remote but it has wake up by gentle massage option. Additionally, the bed also offers “wake up by lifting head section”. On reaching set time, the bed slowly lifts the head section by few degrees to wake you up.